Along with KhaTran car rental discovers 3 Linh Ung pagodas which are very famous as Linh Ung Non Nuoc pagoda, located on the Thuy Son – one of the five Ngu Hanh Son mountains. 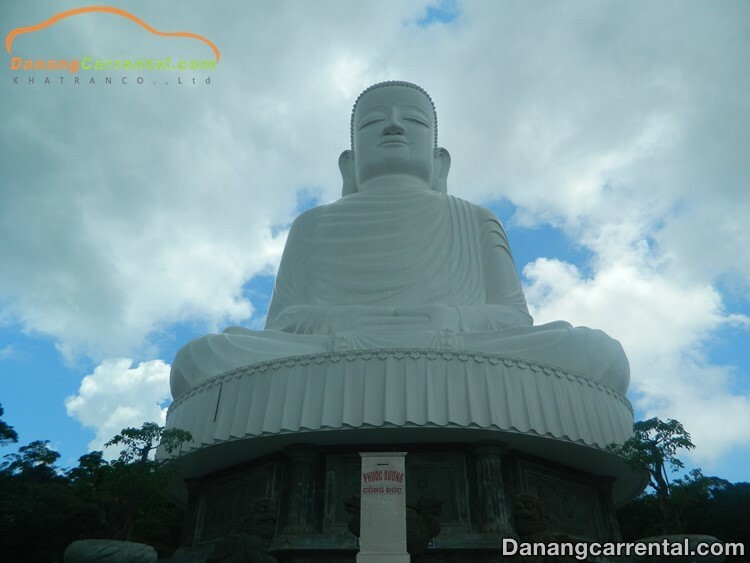 Linh Ung pagoda in Ba Na hills is located on the high mountain of the resort which is called as “Da Lat of the Central” and the Linh Ung Bai But Son Tra which is lying on the middle of the mountain – Son Tra peninsula. Situated on Ba Na Mountain, Ba Na Mountain Pagoda, with an altitude of nearly 1500m above sea level, will be a popular spiritual destination that tourists should not miss when visiting Da Nang. Ba Na Pagoda is boldly architectural Vietnamese pagoda with curved roof, roof top with long rhododendron and a large courtyard lined with stone, in front also has special pine tree with 3 different types of leaves . The temple is in the Northern School, in the main hall there is a very unique drums that is 2.4 meters high. 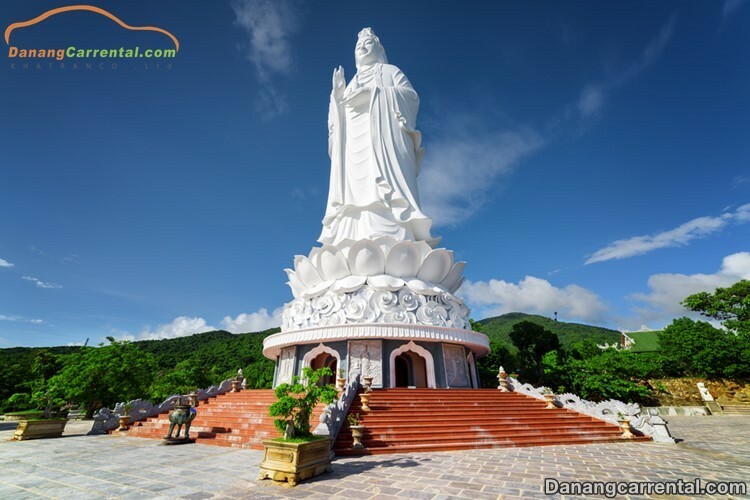 In addition, another special highlight of Linh Ung Pagoda – Ba Na is the magnificent statue of Shakyamuni Buddha, built of reinforced concrete with a height of 27m, 14m across the pillow and meditated on the high lotus is 6m. The statue is carved exquisitely with eight reliefs below, recreating the life of Buddha Shakyamuni who had the founding of Buddhism. Especially, on sunny days, from any tourist spots in the center of Da Nang city such as Love bridge in Da Nang, My Khe beach, Ham Rong bridge … visitors will easily see the statue. The Buddha stands prominently amidst the green of the primeval forest. 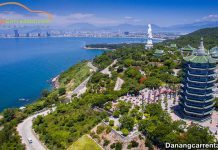 Besides, from the Buddha statue looked down, tourists also enjoy the beautiful picture of the city with the coastline stretching from Hai Van pass to Son Tra peninsula, Da Nang bay, Non Nuoc – Ngu Hanh Son, My Khe beach … and enjoy the fresh air. 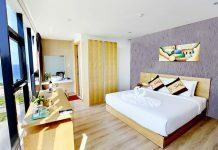 In addition to Linh Ung Pagoda to find peace and relaxation in the soul, visitors also enjoy the comfort of relaxation with modern amenities, high-end facilities in Ba Na Hills tourist resort. In 3 pagodas with named Linh Ung Pagoda, Linh Ung Pagoda – Bai But is the largest, most beautiful and newest pagoda in terms of size and art. It is located about 10km northeast of Da Nang city and located on the Son Tra peninsula, Linh Ung pagoda is considered architectural bold imprint of the development of Buddhism in Viet Nam in the twentieth century. The pagoda is shaped like a turtle, built harmoniously between modern and traditional features with the front facing the sea, while the back facing a vast primary forest. Linh Ung Pagoda – Bai But has an area of about 20 ha, including Tam Bao palace that is the purest place, the most dignified and NhaTo is separated by a yard. In the middle is the statue of Shakyamuni Buddha, on the left is the Tripitaka, on the right is the Bodhisattva Avalokitesvara with 4 Guardians and 18 Arhats are arranged according to the rules, used to protect Tam Bao Palace. In particular, the entire roof of pagoda is covered with cool blue, the adjacent space with roof architecture and airy space. 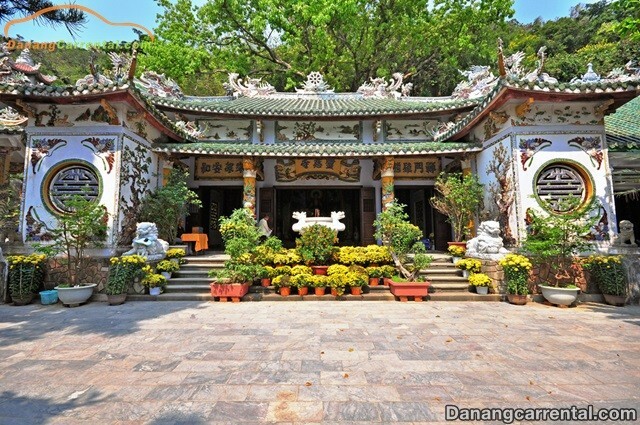 However, the highlight of Linh Ung Bai Pagoda – Bai But became one of Da Nang tourist destinations. It is the tallest statue of Buddha in Viet Nam (67 meters), standing on the mountain and facing the sea. The statue consists of a hand holding a jar of holy water, the other hand presses the samadhi, on the crown with a 2 meters high Buddha statue and at the foot is the lotus attracts many tourists, Buddhists to visit the Buddha. Standing on the 17th floor of the tower, visitors can admire the panoramic city, Son Traisland and far away is the majestic Ngu Hanh Son Mountain with beautiful beaches. About 8 kilometers in the south-east of the city center, Linh Ung Non Nuoc pagoda is considered as one of the most famous landscapes of central Viet Nam as well as the pride of Da Nang people. Linh Non Non Nuoc pagoda is also known as Linh Ung Ngu Hanh Son pagoda or Ngoai pagoda. At the 6th Minh Mang (1825), the king went to Ngu Hanh Son mountain, then he rebuilt Tam Thai pagoda.At the same time, he also built brick pagoda and issued a plaque “Ngu che Ung Chon Tu, Minh Mang luc nien phung tao”. In the third year of Thanh Thai (1891), due to the reluctance of the Nguyen King, the Ung Chon pagoda was renamed as Linh Ung pagoda, and there was a plaque which was written clearly “Cai tu Linh Ung Tu, Thanh Thai tam nien” (It was rechanged into Linh Ung pagoda, the third Thanh Thai). From now, it is called Linh Ung pagoda until this day. In 1997, the XaLoi tower were built on the left side of the pagoda, 30 meters high, and worshiped about 200 stone statues and 40 Buddha, Bodhisattva, and Arhat statues. Pagoda belongs to Hoa Hai ward, Ngu Hanh Son district, Da Nang city which is owning record: The Xa Loi tower has many stone statues. Linh Non Non Nuoc pagoda has come a long way with many times to change its name and restore it. However, the pagoda always keeps a very special sentiment in the heart of visitors who coming here to pray for peace. Standing in front of the Shakyamuni Buddha statue over 10 meters high, Guan Yin or walking around the garden, visitors are immersed in the sparkling landscapes and calm moments. Da Nang is famous for its three temples named Linh Ung and they are located on the prime locations of the city and form a spiritual and mystical travel triangle that attracts many visitors every year. Therefore, if you have the opportunity to visit this beautiful city, do not forget to visit the Da Nang tourism to discover 3 famous Linh Ung pagoda to admire the impressive landscapes and enjoy the peaceful and comfortable moments. 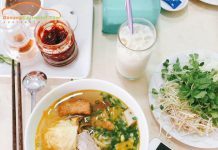 Kha Tran hopes to bring you many interesting suggestions to have more wonderful experiences when traveling the beautiful coastal city of Da Nang. For more specific advice or rent cheap car to visit famous sites in Da Nang, do not forget to contact Kha Tran Car rental via hotline Ms Anna: (+84) 916510201 or Ms Katharine: (+84) 34 797 6789. Wish you and your family a happy journey and many memorable experiences in Da Nang!